Witnesham is basically outer Ipswich suburbia, but from the busy main road it appears two quite separate villages, either side of the Fynn valley. Both sides are quite attractive, but the road in between is a wide, steep race track, and not at all recommended to cyclists. At the bottom of the dip is a narrow lane leading off into the woods and fields, and you are suddenly plunged into deepest rural Suffolk, with an old rectory, a field of horses and an overgrown churchyard. It is like stepping back a hundred years. The first time I cycled out this way, dusk was falling on a late Autumn afternoon. A 19th century mourner and an angel in the churchyard regarded me sorrowfully. The church was locked, and both keyholders were far away, and so far up either side of the valley that I might not have made it back to the church by nightfall. So I wandered through the deliciously unkempt graveyard, accompanied by my angel. Coming back in 2008, I was saddened to find that, not only was the church still locked, but that there are now no keyholders listed. By my estimation, this makes it one of only two of the medieval parish churches in the vicinity of Ipswich which is inaccessible to casual visitors - the other is at Great Blakenham. It also remains one of the few East Anglian medieval churches which I have never seen inside, so I must rely on the eyes of others. 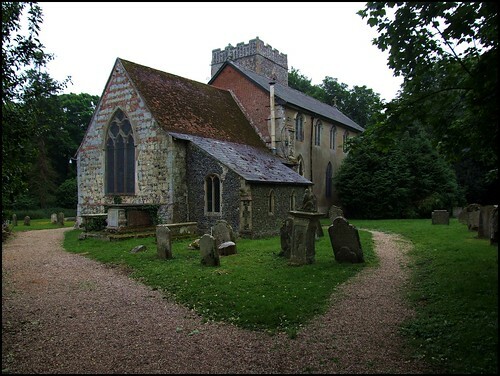 Although the church was Victorianised, this was done fairly early on, and it is still substantially a typical Suffolk church of the 14th century, with a clerestory, but no aisles, added on the eve of the Reformation. The eastern end was rehashed at sometime. Early in the 17th century, a clock and a sundial were added to the south face of the tower. Why both, I wonder? The porch is beneath this south tower. Sam Mortlock suggests that the inside was restored with more taste than imagination; the font is recut, the floor relaid. and he attributes the woodwork to the great Henry Ringham. An interesting survival of the 18th century is the set of painted texts in panels on the walls, as at Hemingstone.The glass of the east window is early 19th century, and therefore interesting. But there is also a single pane of medieval glass, depicting a small furry animal. Neither Cautley, Mortlock or Pevsner could identify it. I wonder what it is.